Hot, high and dusty - an exciting weekend’s racing in Colorado resulted in 6th place in the General Classification for GT Factory Racing’s 17 year old Martin Maes, even allowing for the disappointment of a last minute crash on SP7. 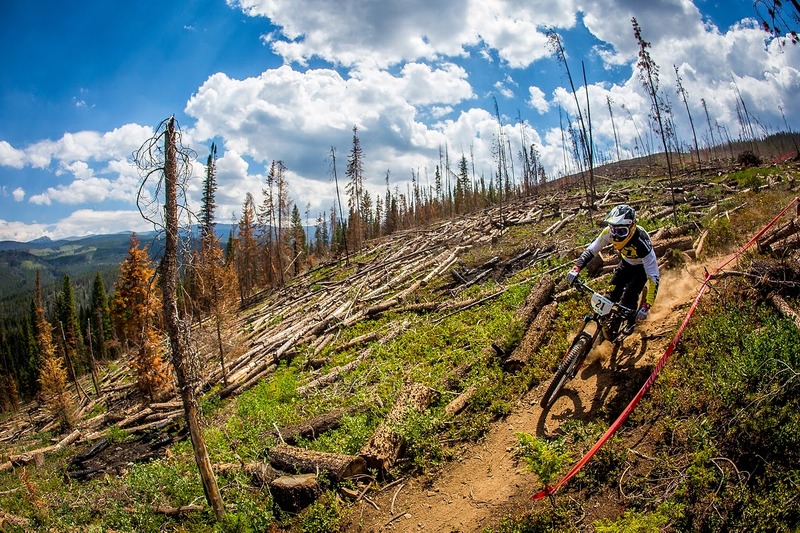 Teammate Dan Atherton was delighted to be back at the races and showed he is close to full race fitness with a storming Stage 1, but chose to ride conservatively for the rest of the weekend to allow his leg continue to recover. Official results show Dan in 50th place but this includes a 1 minute time penalty without which he would have achieved 22nd – not bad for a rider who was ‘taking it steady’. Racing started Friday morning in high temperatures (87F). Both GT Factory Racing riders were on fire and couldn’t wait to get on track. Stage 1 was fast-flowing with some fast jumps. In practise both riders were getting good air and having Dan back as team-mate provided a noticeable boost to Martin’s confidence. ine at 9.49.39 in 4th place. Lower down the ranks were some fast riders (including Dan who started in 62nd having raced only one stage this season). Stage winner Richie Rude started in 35th and Mitch Ropelato started 70th. Martin’s eventual rank for the stage was 9th while Dan was stoked to battle his way up to 11th. Going into Saturday (Day 2) the weather was cooler and slightly overcast; Martin was in 5th overall, 30 seconds off the lead. He flew down the Stage 3 course in 05:43.046, enough for 6th. After some confusion, Dan was given a 1 minute time penalty for starting the stage early. (This meant that his stage 1 position was revised to 113th). After that he put in a steady to run to post 06:06.105. Stages 4 and 5 were very short (around 90 seconds for stage 4 – a ‘surprise’ stage with just one practise run allowed). The stages led on to each other with just 9 minutes’ transfer and were fast, ‘pedally’ sections that required maximum flow to do well. Martin battled hard to take 12th on both stages: 01:29.114 for Stage 4 (about 4 seconds behind Stage winner Jared Graves) and 06:01.294 for stage 5. Dan posted 01:33.015 and 06:16.063. At the start of Day 3 Martin was in 7th place overall while Dan was sitting in 65th – and loving being back at the races! Sunday’s Stage 6 was delayed for over 90 minutes with a racer down and requiring hospital treatment. When the race eventually started, Martin had another flyer, taking 7th on the stage. Stage 7 - the finale to three hard days racing - was short, steep and dusty. Graves rode conservatively to protect his lead, putting in a 6:06 but tension ran high as successive riders went ahead of him - had he eased up too much? Justin Leov went clear of Graves by 10 seconds with 5:56. Martin had his sights set on a stage win and top 3 overall and he went fast, but disaster struck as he crashed out. He crossed the line in 8th (06:06.005) which held until Richie Rude flew into first place by 6 seconds clear of Justin Leov. The home crowd went wild! Rude’s fellow American Mitch Ropelato took the stage second and Melamed moved into 10th. Cedric Garcia took 11th place, pushing Martin back into 12th on the stage. Martin said: “So it was a long weekend! Stages were pretty different - some really enjoyable and some not so interesting for me. I rode quite steady all weekend until the last downhill stage where I wanted to win! I had a perfect run but at the end of the stage I crashed badly and probably lost 10 seconds at least. That's racing and it's why I love it! I'm trying to put everything together and get more experience so next year I'll be even more ready to fight for the win.